How generous of TiVo to allow you pay $199 for the ability to keep on using the so-called "Lifetime Subscription" in your new TiVo Series 3 units. As you may know, the lifetime subscription feature has been cancelled on all new sales of TiVos, including on the upcoming Series 3 box. 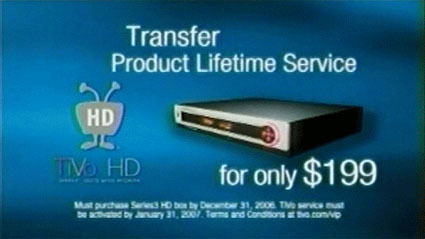 Now, if you've already purchased a lifetime subscription for your Series 1 or 2 device, you can fork over two benjis and have the magnanimous people at TiVo let you continue to use what you paid for. To recap, $800 for a Series 3, $200 for TiVo, and a couple more dollars for tax and shipping. I'm sorry sir, it looks like you won't be able to buy that thing you wanted this month. You know, food.